Silk Embroidery Floss by Needlepoint, Inc.
Needlepoint, Inc. is a reeled filament silk (as opposed to a spun silk), which means that the individual fibers that make up the threads are longer and stronger. The luster of a filament silk is also greater than that of a spun silk. The threads are 8-ply, meaning they can be divided into 8 individual threads, and they come in 5 meter skeins (or really large hanks of 45 meters, for those BIG projects!). The company produces its own Chinese silk for its threads; they claim that they therefore have better control over quality and over availability, which makes sense. What I like about the Needlepoint, Inc. threads is that the shades are carefully graded, so that you can easily select from the color card or the rack a series of colors (say blues, for instance) that will blend into the next lighter or darker shade really nicely. 1. Needlepoint, Inc., silk is slightly more expensive – averaging around $3.80 – $4.00 / 5 meter skein, whereas Soie d’Alger averages around $3.40 – $3.75. 2. 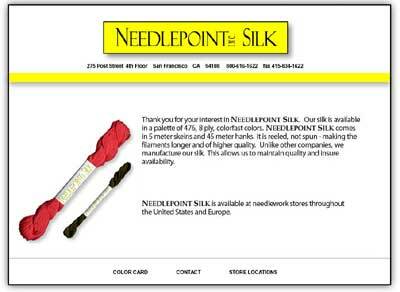 Needlepoint, Inc., silk has one more ply per strand, which means you are getting a little more thread in 5 meters. 3. Needlepoint, Inc., comes in 476 colors, whereas Soie d’Alger comes in over 600 colors. 5. In my opinion, Soie d’Alger has a “richer” sheen to it. For stitchability, Soie d’Alger always wins out with me. It may be because I’m used to it. I do use a variety of threads, though – and I do like stitching with the Needlepoint, Inc., silks. Still, I seem to get better results, and a smoother stitching experience, with the Soie d’Alger. If you want to see what colors they have available, check out the Needlepoint, Inc. color card. 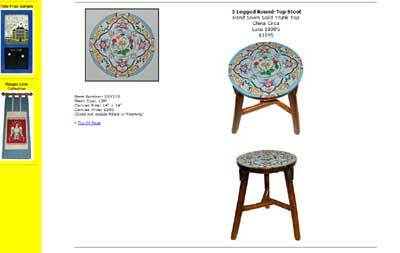 You can also browse the Needlepoint, Inc. website for needlework items, primarily (as the name implies) needlepoint. The most intriguing part of the website, in my opinion, is the furniture section – some really ambitious and beautiful stuff in there! If you want to find out if there’s a store near you that carries Needlepoint, Inc. silk, they have a convenient store locator online as well. As soon as my camera’s back, I’ll post some photo comparisons! Can you please tell me how many strands of Needlepoint Inc. Silk to use on 28ct. crossstitch fabric? I’d loved to start my project, but there is no information about this and it is my first time trying silk thread. I’d appreciate your kind reply. Next Next post: Recycled Silk for Embroidery?